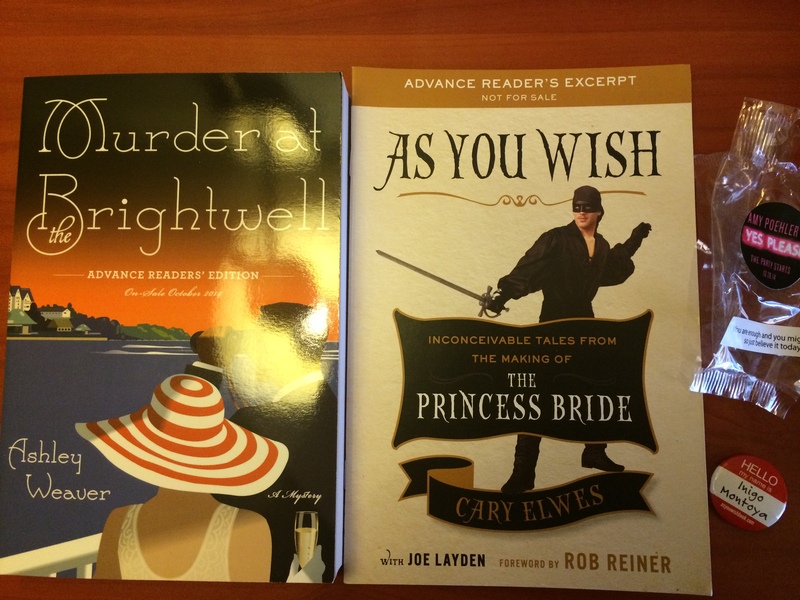 Finally, it’s my last post about BEA 2014! (But you can still check out parts one, two, and three.) 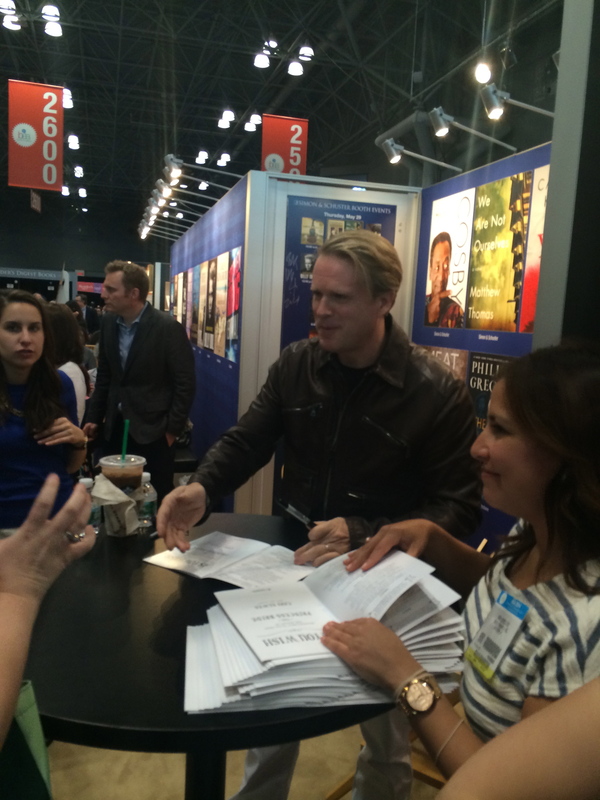 The biggest lesson I learned from BookCon is that I will (most likely) NOT be doing it again! It was absolutely INSANE. The prior days of BEA were limited to people with some type of connection to the publishing industry, but BookCon was open to the public; anyone who bought the (relatively inexpensive) ticket could come. As a result, the Javits was almost unbearably crowded, and the lines were ridiculous. CARY ELWES: Hi, what’s your name? So that was pretty awesome. And I did talk to some really nice people in the line, so it wasn’t a total drag to be waiting there! Then I immediately got in line for the Amy Poehler event, which was supposed to start at 12:30. I got in line at 11:30, and once again, the line was incredibly long already! I did eventually get a seat in the events hall, but I was in the very back, and I could barely see anything. (It didn’t help that some woman in front of me thought it would be appropriate to stand up so she could film the whole talk on her phone.) At least I could still hear them, though, and it was a thrill to listen to Amy Poehler (whom I love from “Parks & Rec”) talk about her career and her upcoming memoir, Yes Please! When that was over, I thought about going to a couple more panel discussions…but honestly, I was wiped out! I went back to my hotel to chill out and read. In the evening I went to a local pub for the “Meet and Drink” activity sponsored by Katelyn from Tales of Books and Bands (host of the Tune in Tuesday meme! ), Andrea from The Overstuffed Bookcase, Alexa from Alexa Loves Books, and Jen from YA Romantics. It was really fun to meet some great bloggers in a less hectic setting — and I definitely needed a drink by the end of BookCon! 🙂 I’ve begun following a bunch of new-to-me blogs, and I hope to increase my participation in the blogging community in the future! 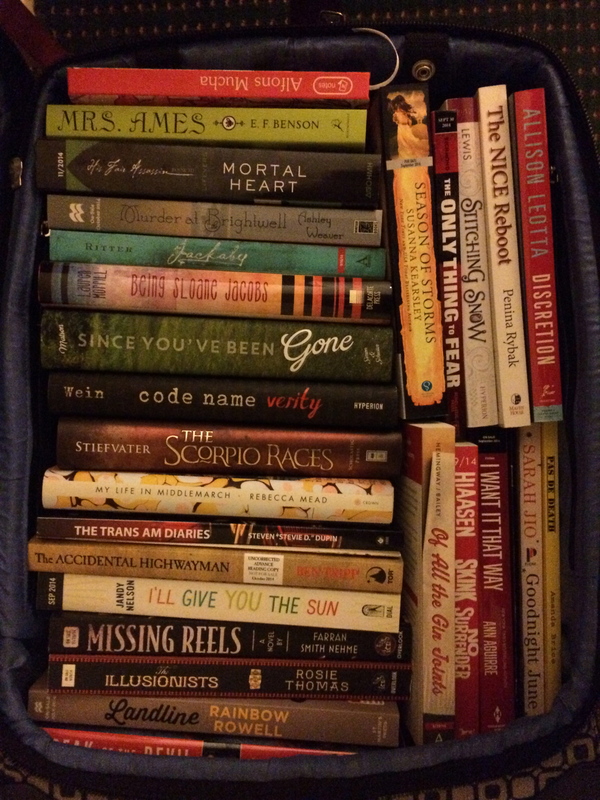 This is what my suitcase looked like on the way home from BEA. My dirty clothes were flung haphazardly into a backpack. I’ve got my priorities straight! You got some good books there. And it all fit in that tiny suitcase of yours! I’m shocked. Impressed, too. I’m going to pass on Book Con, too. I mostly stayed on the BEA side. It was too crazy on the Book Con side. Haha yup. I was going to go to more panels and things in the afternoon, but by then I had had ENOUGH. 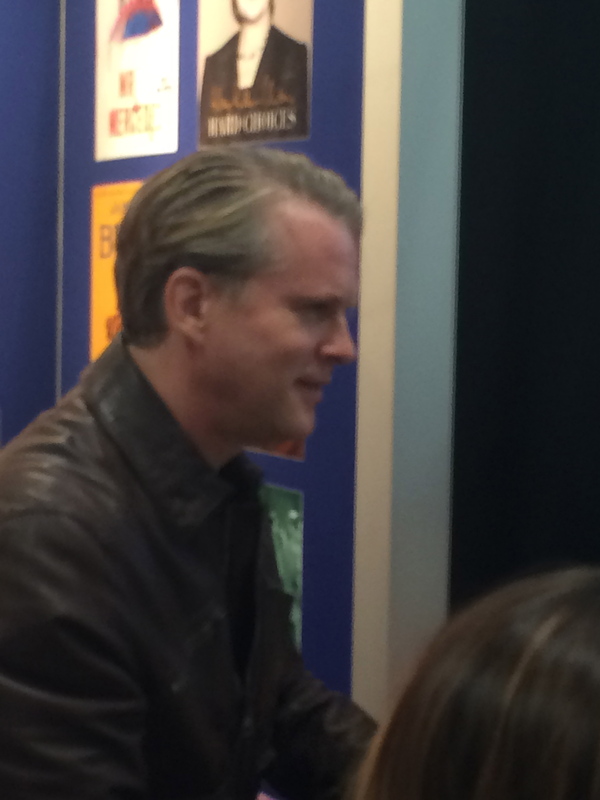 Meeting Cary Elwes was great, though! Ah the fun and madness that is BEA! Jealous you snagged Landline and Mortal Heart–those are among my highly anticipated fall books! Thanks for the detailed BEA posts! Crowds freak me out and I’m no good at meeting celebrities (don’t know what to say to them), but very cool you met Cary Elwes. So, you would do BEA again but skip BookCon? Your other posts sound awesome, plus you got Landline! Haha, I don’t know what to say to celebs either. I comfort myself with the thought that it doesn’t really matter, as they won’t remember me 5 minutes later! And yeah, I think my conclusion is that I would go to BEA again, but I’d skip BookCon and probably also BloggerCon (I feel like if you’ve done it once, you probably don’t need to do it again! ).